Happy New Year all! I’m not the only one that is happy to put 2013 behind us. Another year of budget sequesters, government gridlock and grinding recession behind us. 1. 2014 will be better! People will feel more secure about work, the economy and technology in our lives. The wonder of camera resolution, ease of UI, and ever lower network costs will amaze and confound us. “Wearable” will be the “Watch-word” for 2014, even though no one knows what it means, or how it will appear. Don’t worry, no one really cares, but phones will get cheaper and better, and people ever more glued to the device in their hand. 2. CES 2014 will be useless. No one will go there but the news reporters, and they will report on virtually nothing. However, virtually nothing is useful these days, and virtually nobody will watch virtually nothing on their mobile device. 3. Over the year Samsung will release Galaxy S5, with variations; Mini, Active, Note, Light, Heavy, Super, Ultra, Modern, Watch, Catch, Pitch and Visionary. Covering every size in half inch increments from 3-inches to 110-inches, some people will starve in Verizon stores trying to figure out which one is best. Someone will write an app to remove crapware from Samsung phones, sell it for $5, and make more money than Angry Birds. 5. In April, Nokia – minus it’s products and services division – will release the first Nokia Android phone. By August the new Nokia will be double market share from prior to the Microsoft sale. 6. In May, Google Glass will be released to consumers. At $595 they will require you have a current Smartphone ($500 plus $80 per month for 2 years). So this means every Glass user will have a $3000 investment for a device that goes from purchase to drawer in a record 48 hours. Meanwhile, Bluetooth headsets, microphones and accessories will drop by half in price, becoming 4 times more effective. Glass is not useless. Just in it’s first year. Remember the Google G1 Android? 7. In June HTC will introduce a new phone, called the HTC One. (Nowithstanding that their 2013 phone was the HTC One, and their 2012 phone the HTC One X). A CNet reviewer will accidentally buy a two year old HTC One X on eBay and declare it the best phone of 2014. 8. In October, Apple will release iPhone 6, which will feature a new water ripple effect and come in tropical colors. On the $700 iPhone 6LX the water ripples will make the case glow. People will line up for hours to buy the new phone, proclaiming that ripples will change their lives. 9. BlackBerry/Palm comparisons are epic. Consider Palm Treo compared to BlackBerry Classic, and Palm Pre compared to BlackBerry 10. BlackBerry has said they will abandon their hardware business to focus on Enterprise Secure Software (sounds like Palm focusing on webOS in the last 9 months of Palm). After September earnings BlackBerry will sell to Lenovo for $1.8b, with the Chinese Government a silent partner and ultra secure BBM network will be used by the Chinese Army to spy on the NSA. 10. Voice CRM is on the horizon. Look for App makers to increasingly include voice as part of their applications. Voice Dial was one of the most powerful features of BlackBerry 7, but BlackBerry has abandon that technology in their new focus. Look for other vendors to capitalize on business use of voice applications. There you have it! Have a happy new year. User reports (here and here, for example) outline the Kies 3 problems when synchronizing Microsoft Outlook with Note 3, Nexus 5, Galaxy S4, and Android 4.4 and Android 4.3 devices. This thread reports the Outlook Calendar and Contacts synchronization tab is entirely missing in Kies 3. The Kies home page on Samsung’s US website has no mention of Outlook Calendar or Tasks. It is unclear if this means Kies no longer supports Outlook Calendar and Tasks sync, or if this is an oversight by the marketing of website team. CompanionLink is a great Kies alternative because it synchronizes more Outlook fields like Outlook Notes, Tasks, Journal, Birthdays, and Meeting Invites, and supports Outlook Categories with matching colors. You can also work with multiple Outlook Calendar and Contacts Folders. CompanionLink lets you choose how to sync – USB, WiFi, or automatic Cloud sync. CompanionLink is backed by US-based telephone support at no cost. CompanionLink never pushes updates on their customers, so the software you purchase is guaranteed to be the same unless you change it. Read more about CompanionLink for Outlook here. A full license costs $49.95, one-time. Enter code K3ALT in the Affinity Code field on our order form to save $10. CompanionLink 6 ships with new Sync Dashboard, DejaOffice CRM Live web portal, 12 months of DejaCloud wireless service, and more! DejaOffice CRM Live web portal. Optional, but this service lets you store and access your data from any PC or mobile browser. It also serves as a convenient backup should you lose your phone or corrupt your database. 1 year of DejaCloud service for automatic push sync between 5 phones, tablets, and PCs. New Setup Wizard with visual feedback about your configuration settings. Get a summary view of your most recent sync when you launch CompanionLink 6. See how many records you are syncing, when the last sync was, and what your configuration is currently like. DejaOffice is now available as a web-based CRM. If you decide to use our DejaCloud service to sync data, you will get a functional cloud CRM service that automatically integrates with phones, tablets, PCs, Macs, and other web services like Google and Office 365. Use any PC, Mac, or mobile browser to access your data online. DejaCloud push sync keeps CRM data automatically updated between phones, tablets, and computers. This works for all modern smartphones and tablets. No need to tap or click synchronize – things just work! A new wizard visually guides you through your setup and shows the data security measures available for the different ways you can sync data using CompanionLink. CompanionLink supports new Act! v16, Company fields, and direct integration to Office 365 cloud accounts and Outlook 2013 desktop software. Support for Salesforce CRM is now included in all versions of CompanionLink. CompanionLink is humbled to read about our customer Chi Onwurah, Labour shadow Cabinet Office minister and MP for Newcastle Central, UK. In her article “Reluctantly and unhappily moving to the cloud,” Ms. Onwurah writes of her experience moving from Palm devices to Apple and Android. All cloud services rely on passwords stored on the device. Any stored password is subject to loss of the device and hacking into the cloud vendor’s online database. Cloud vendors may use your stored data for advertising, or they can share your data with outside firms, government agencies, and even foreign governments. Ms. Onwurah notes that because she is a UK Cabinet Minister, storing her contacts in the cloud may violate national standards since some cloud databases are now known to be sharing information with governments like USA. CompanionLink urges Ms. Onwurah to continue using the CompanionLink synchronization that she has used for her prior phones. We continue to support cloud-free synchronization for every new phone and tablet on the market, including new iPhone, Android, BlackBerry and Windows Phone devices. We supply secure USB sync for these devices, just like the old Palm Hotsync. With connected sync, your data is not shared or stored with any cloud server, and no password is needed. In addition to USB Sync, CompanionLink offers two options for encrypted wireless sync. CompanionLink Wi-Fi sync uses AES-256 bit encryption, the strongest allowed, even for data moving from your PC to your device in the same office. CompanionLink Secure Wireless Sync transfers data to your device over-the-air without storing your data on a cloud server. Both of these technologies are password-based, but the password that is used is local to you, and is used solely for passing the data in a stream that discourages decryption. CompanionLink is a proven provider of synchronization systems, having supported Contact and Calendar devices since in 1988 and Casio BOSS, the first connected organizer. We thank Ms. Onwurah for using CompanionLink in the past, and we encourage her to continue using CompanionLink with her new phones, whether they are Apple, Android or whatever comes next. CompanionLink will keep providing secure ways to stay mobile, without forcing anyone to share their contact and calendar information with unknown or unaccountable systems and parties. We’ll show you how easy it is to sync Samsung Galaxy Note3 with Microsoft Outlook. It takes less than 10 minutes to set up. Get your full Outlook data set to your Note 3; contacts, calendar, tasks, notes, categories, journal, alarms and reminders, and contact photos. CompanionLink automates the sync process with three simple configuration steps. Complete Outlook data. We sync Outlook contacts, calendar, tasks, notes, journal, categories, alarms and reminders, and contact photos. USB, WiFi, or Cloud sync. 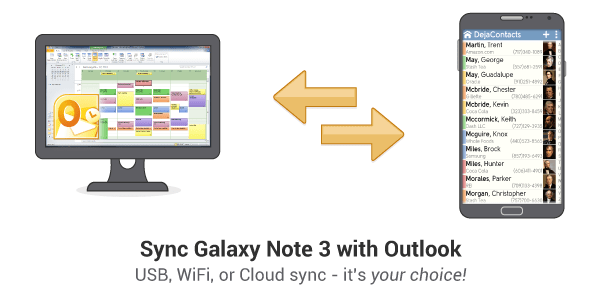 We let you choose how to sync Galaxy Note 3 with Outlook. Some prefer the security of cloud-free USB or WiFi sync. Others prefer the convenience of Cloud sync. We let you choose. Plug-and-play experience. Just connect your Galaxy Note 3 to your computer. The sync should begin automatically once CompanionLink is configured. No drivers required. Our sync does not require downloading of messy ADB drivers, hard resets of your Note 3, duplications, switching to Mass Storage Mode, or lost data during the sync. Outlook-like experience on Note III. We offer a free app for Note 3 called DejaOffice. It is designed to hold all Outlook data in one app (contacts, calendar, tasks, notes, alarms, reminders, categories, journal, and contact photos). Our app encrypts this data so no one can access it even if your phone is lost. Samsung devices ship with free software to sync Galaxy Note3 with Outlook. Many users report frustration with this option and problems with Outlook data corruption. If you don’t want to risk this with your data, CompanionLink is for you. We even offer free US-based phone support if you ever need help or have questions. An additional level of security we offer for business customers is through our $49 RunStart package where our team of experts handle the setup for you. This is a wonderful service for people short on time or those unwillingly to risk losing many years worth of valuable data. Install our CompanionLink for Outlook product to your PC. It is free to download and try for 14 days. Or, just buy it for a low one-time cost of $49.95 for uninterrupted sync. We offer a full money-back guarantee if you don’t like it. Download our free DejaOffice app for Outlook on your Note 3. It is available from the Google Play store. Our app holds the Outlook data that you synchronize. Synchronize using CompanionLink. Choose from Direct USB Sync, WiFi Sync, or our DejaCloud wireless sync with AES 256-bit encryption. All three sync options are secure. That’s all there is to it! Yes, it’s really that simple to sync Microsoft Outlook to Galaxy Note 3. Give it a try and please share your feedback below. Great news for Windows Phone users who wanted the security of USB synchronization of business data. The latest version of CompanionLink for Outlook has USB Sync to Windows Phone 8 devices like Lumia, Ativ, Ascend, and HTC 8X/8S. CompanionLink synchronizes Windows Phone with standalone Outlook contacts, calendar, tasks, and notes. (Support for Outlook Categories coming in a few weeks!) Our USB Sync is designed to restore the traditional wired sync feature that shipped with older Windows mobile handhelds. Just connect your Lumia, Ativ, or HTC Windows Phone to your PC and CompanionLink handles the rest. The synchronization works with our free DejaOffice app for WP8 that integrates with WP8’s People app. The Outlook Contacts, Calendar, Tasks, and Notes that DejaOffice holds work with phone features like Caller ID, email, maps, and text messaging.